Piecing together is the heart of SMA. As a member-based studio, we are a large group of creative, generous people working together to nurture community at all levels. We offer a lovely, light and color-filled shared space to work creatively with others, to learn, and to be inspired. SMA and its members are using their hearts and hands to bring beauty and foster community. From a welcome sign at a local Pea Patch to the mosaicing of the pediatric ward of a hospital in Haiti, we are involved at all levels: fundraising, technical support, education and, of course, hands-on tiling. 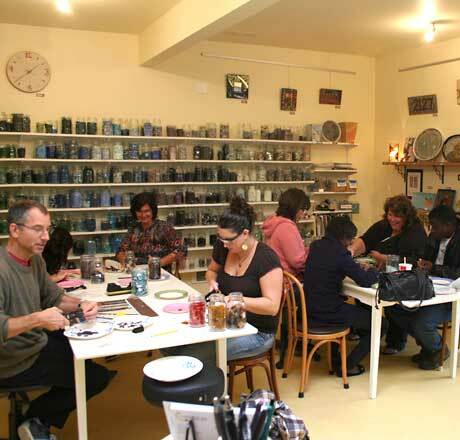 Committed to the growth and development of mosaic art in the Pacific Northwest, SMA provides resources, materials, support and space for the sharing of all things mosaic. As a family doctor with over 20 years experience of practicing medicine, Claire Barnett never imagined that she would be opening a mosaic studio. Her path to this studio has been long and forged with heartache. She began creating mosaics after the tragic deaths of her two young daughters and their father on the Alaska Airlines Flight 261 plane crash in 2000. Her first mosaics were made with family and friends as group projects to mark her daughters’ birthdays. As her back-yard gradually filled with memorial garden stones, Claire began expanding her study and experience in mosaic art. She has studied traditional methods in Italy, including both the Ravenna and Venetian Methods, and has adapted and modified them over the years to create a simple technique for both beginners and advanced mosaic artists. Claire opened SMA in order to share these methods, and to offer this accessible and satisfying medium to others – both as an individual creative process and to bring beauty into the world. Emily Margherio walked in one day shortly after we opened in 2009, and she has been with us ever since. She had little mosaic experience when she started but came full of creative energy and kindness, the two most important criteria for the studio. She has flourished and grown over the years both as a mosaic artist and as an assistant in running all sorts of things at the studio. She is now our Studio Manager and teaches and supports customers and members with all things mosaic. Her gentle way of helping and teaching makes her an invaluable member of our team. Veronica Mortellaro has been a loved and vital part of the Seattle Mosaic Arts team since 2014. She is skilled in teaching and encouraging creativity in artists of all levels and confidence. Veronica studied art at Colorado State University and has an ongoing creative practice when she is not teaching or nipping glass here at the studio. She is currently working on a series of figures using ink as her medium. Seattle Mosaic Arts has grown out of the experience created by a large and incredibly creative and supportive group of people. It is not possible to separate one from the other. Claire and Seattle Mosaic Arts are supported, encouraged, and egged-on daily by Claire’s partner, Mazie, who likes to call herself “the brawn” behind the project. Claire’s mother, Jacqueline Barnett, a local professional artist and the one responsible for teaching us mosaics in the first place, is clearly “the brains” behind this. Claire is amazingly surrounded by family members, both immediate and extended, as well as friends who have become family after so many years of accompanying her on this hard path, and this impressive group of loyal, dedicated and generous people have contributed, and continue to contribute, in endless ways, to the creation of this studio. This studio was created out of the support and love from my community. I can only hope that this sense of community will continue to expand and flourish in this new form, widening the net with which we can all support and encourage each other.